This fall, we’re thrilled to have five alumnae artists exhibiting their work on our third-floor gallery in the Senior School. Topographies: Relationships with Landscape and Geography, brings together work by Ruth MacLaurin ’60, Patricia Hindmarch-Watson ’67, Sally Clark ’71, Nicole Steinbrecher ’06, and Brittne Potter ’12. In these abstract and representational works, the artists explore inner and outer landscapes using a variety of media including oils, acrylics, graphite, ink, and collage. Sarvenaz Armanat, Class of 1997, assisted Susannah Smith, YHS Museum Curator, in organizing the exhibition. Sarvenaz is a visual artist, a museum educator at the Vancouver Art Gallery, and the Director of Gallery1515 in the South Granville gallery district of Vancouver. 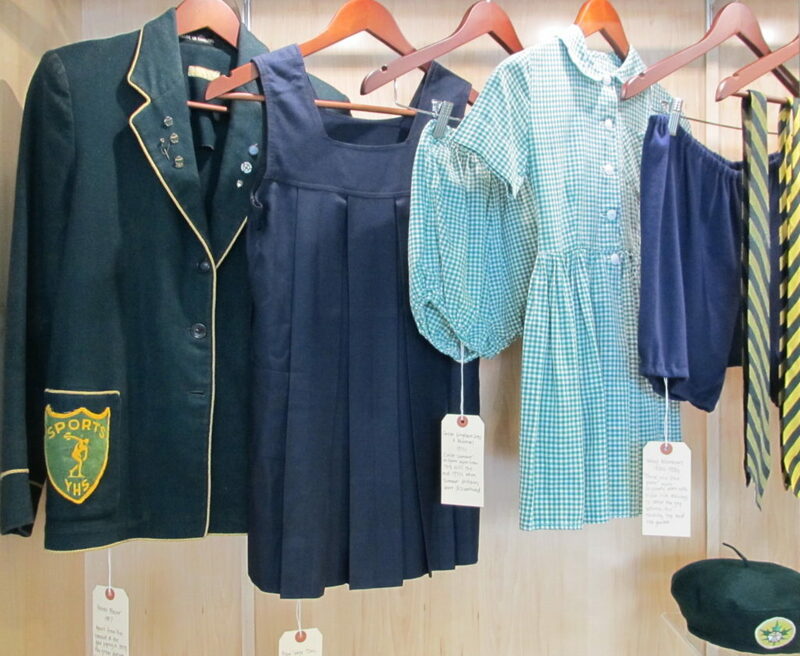 In the glass cabinet at the south end of the gallery is a “curated closet” featuring highlights from 85 years of YHS uniforms. 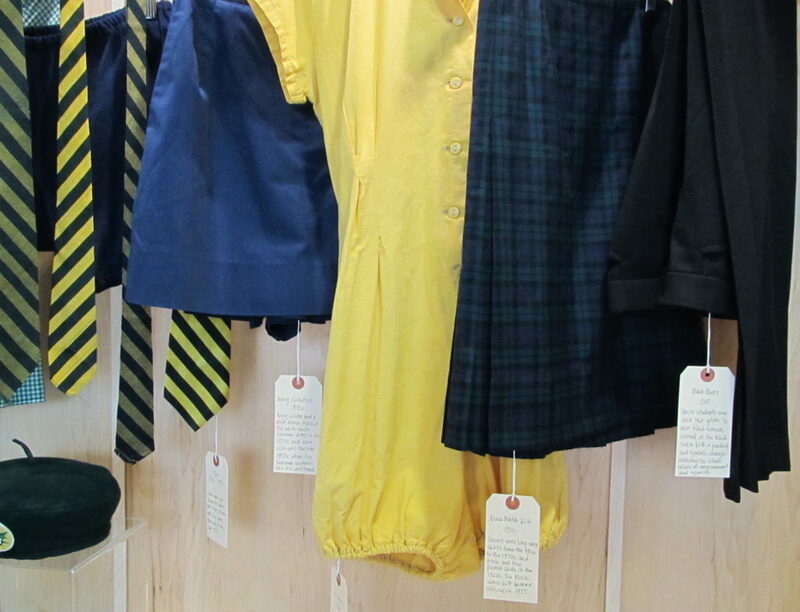 Here, you’ll find a green blazer from the 1950s, an adorable green gingham junior summer uniform with matching bloomers, the (in)famous 1960s yellow gym romper (the “pumpkin suit”), and the newest addition to the uniform: black tailored pants. Fall 2017 is the first time that Senior students have the opportunity to wear pants instead of the Black Watch kilt. After a successful student-led proposal earlier in the year to incorporate pants into the uniform, we can now celebrate wearing pants as a practical and symbolic change that reflects our image as a progressive and inclusive school community. If you haven’t visited the Senior School yet this fall, make sure to pop by soon and check out these visual treats on the third floor! Alumnae Day 2017 was a spirited and inspirational affair with adventure, travel, and personal safety the focus this year. 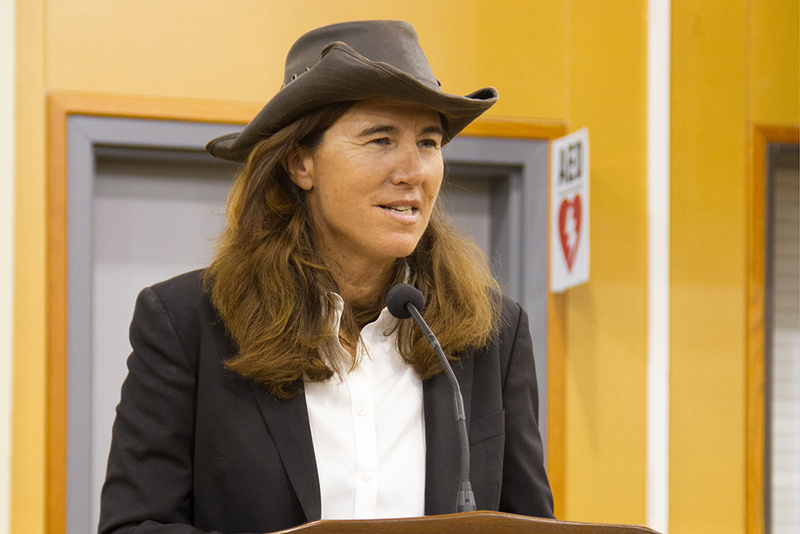 Dianne Whelan from the Class of 1983 was our keynote speaker and she captivated everyone’s imagination with her tales from her 500 Days in the Wild. Her Trans Canada Trail expedition has become a bigger journey than she ever anticipated and her stories enthralled and animated a very appreciative audience. 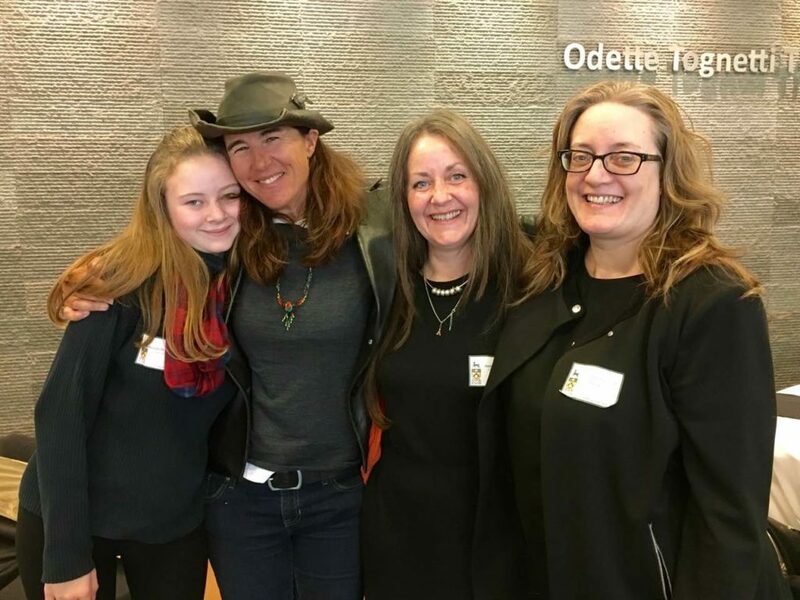 Dianne Whelan with classmates Andrea Turton ’83, Andrea’s daughter Annabelle Turton ’22 and Kirsten (Koopman-Sutton) Osterreicher ’83. 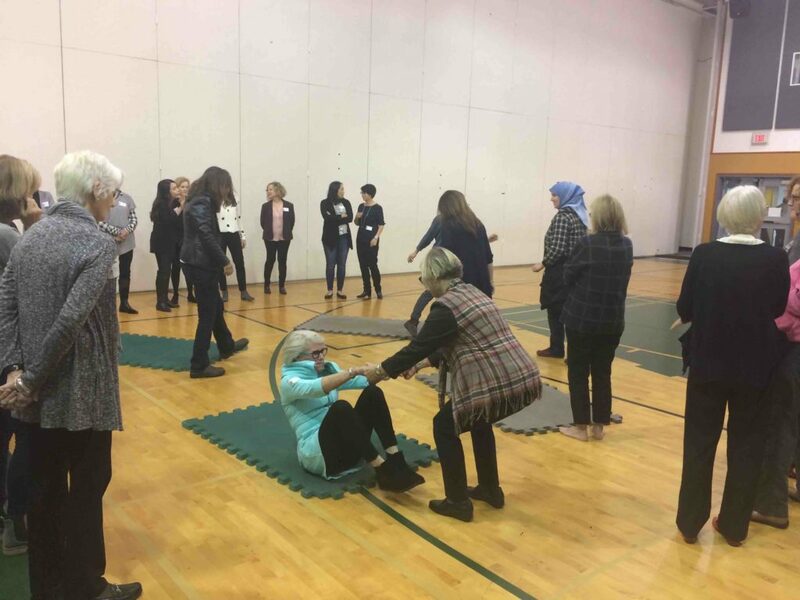 Following Dianne’s talk, everyone moved to the Rand Gym to take part in a self-defence clinic by alumna Dr. Emel Zerrouk from the Class of 2004. Emel has been involved with martial arts and self defence all her life and was delighted to share her knowledge with fellow Yorkies. Alumnae, young and old, participated in what was a very thorough learning experience. Emel expertly shared smart tips and worked through various self defence moves and scenarios with the class. Laughter filled the space as everyone engaged with a partner and shared safety strategies. After lunch, the alumnae art exhibition Topographies was officially launched by our curator Susannah Smith and we welcomed artist Patricia (Symonds) Hindmarch-Watson ’67 to discuss her works on display. 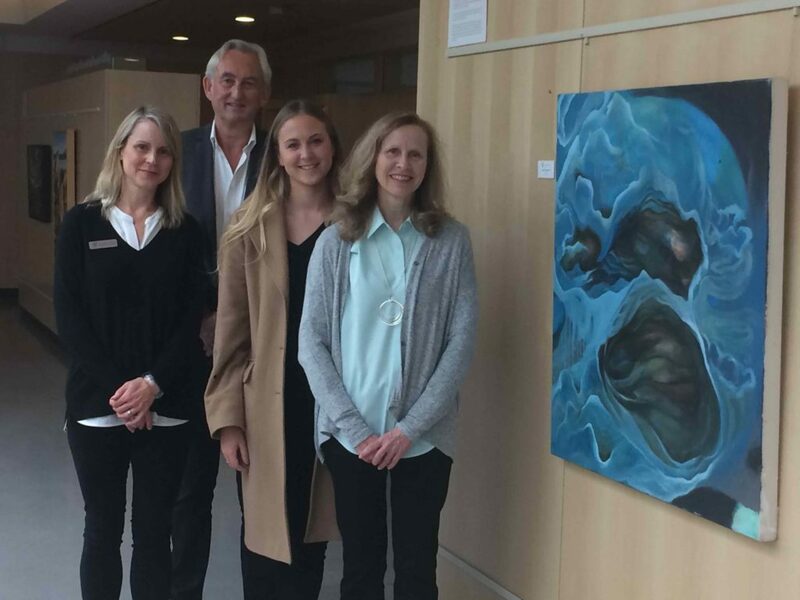 Artist Brittne Potter ’12, now based in Montreal, showcased her paintings as part of the exhibition and, while Brittne couldn’t be there, her family, including her sister alumna Alana Potter ’09 attended. Other artists exhibiting included Sally Clark ’71, Nicole Steinbrecher ’06 and Ruth MacLaurin ’60. Geraldine Santiago ’83 attended YHS from 1979-83 and was known as being energetic, fun-loving and a good friend. The middle daughter of four Santiago sisters that attended YHS, she was Vice Head-Girl, served as Class President twice and was House Member of the Year. Geraldine was also the recipient of several awards including the Senior Spirit Trophy, Parents’ Association Citizenship award, and the Joan Sorenson Memorial. Once she graduated, her interests turned to Asian Studies when she attended the University of British Columbia to obtain a degree in Mandarin. Always driven to succeed, Geraldine launched her career in real estate and became known for seminars targeted at first time home buyers. 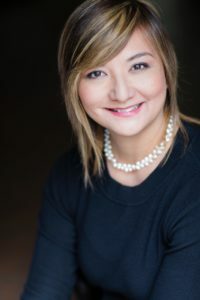 Over the past 16 years as a realtor, she has written three real estate reference books for Self-Counsel Press Ltd, entitled, “Complete Home-Buyer’s Guide for Canadians”, “Selling Your Home in Canada” and “Buy and Sell a Recreational Property in Canada”. Geraldine is also an accomplished painter known for her use of bold colours in oil and acrylic. In addition to solo and group exhibitions in Vancouver, she has also been an Artist in Residence teaching acrylic painting to children from K-12. When Geraldine’s daughter, Luisa, was only five days old, she was rushed to the BC Children’s Hospital with a serious, potentially life threatening viral infection. Their skilled staff, nurses and doctors were able to provide critical services that resulted in her daughter’s full recovery. Geraldine’s desire to give back to these doctors and staff inspired her to use her creative talents to write and illustrate a children’s storybook. 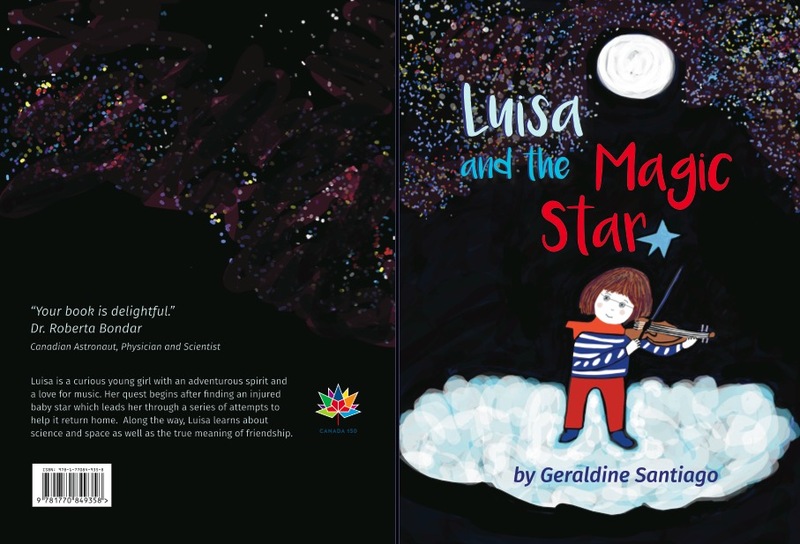 Geraldine hopes that her storybook creates an interest in both science and music in children. 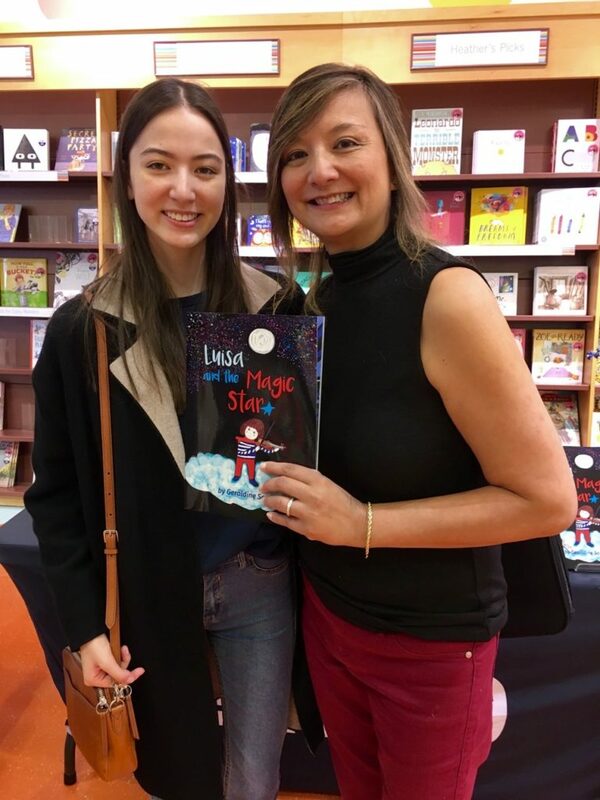 In fact, the main character is based on her oldest daughter Luisa, who learned to play the violin at the age of five and is now enrolled in an engineering program at the University of British Columbia. Recognizing that, as early as elementary school, many of the science and space picture books for young readers are designed for boys, Geraldine is intentionally introducing strong, relatable, female characters in her books that break stereotypes and gender boundaries. 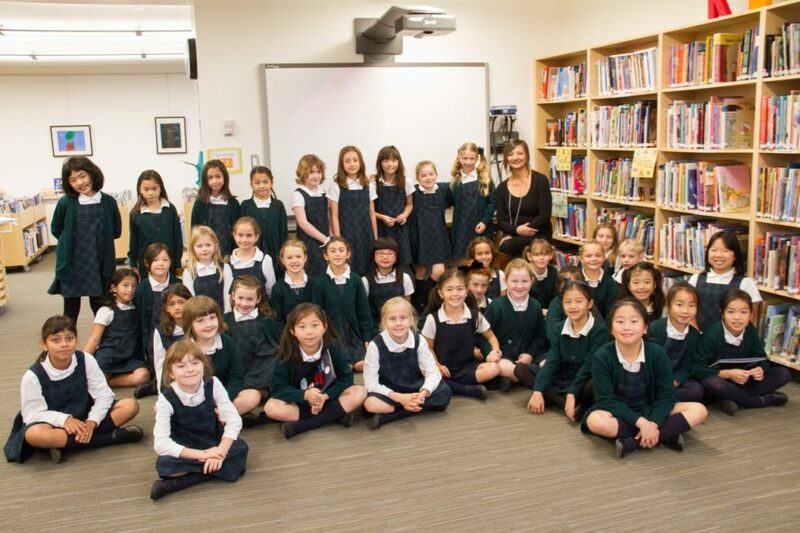 Geraldine was delighted to visit York House School on November 2nd to read “Luisa and the Magic Star” and her new sequel, “The Star Thief” to the Grade 3 classes. After the reading, students asked lots of questions and took part in fun word rhyming activities. She hopes to inspire the next generation of children to embrace space and science through her cleverly written and beautifully illustrated books. 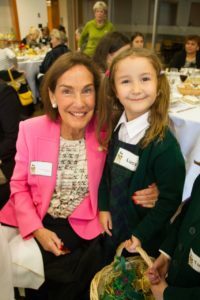 On Founders’ Day, October 13, 2017, alumnae from 1942 to 1967 were welcomed back to school by student executives as they arrived to join the whole school for the celebration of the school’s 85th birthday. After assembly, there was much to share about the morning’s festivities at the Golden Alumnae luncheon. 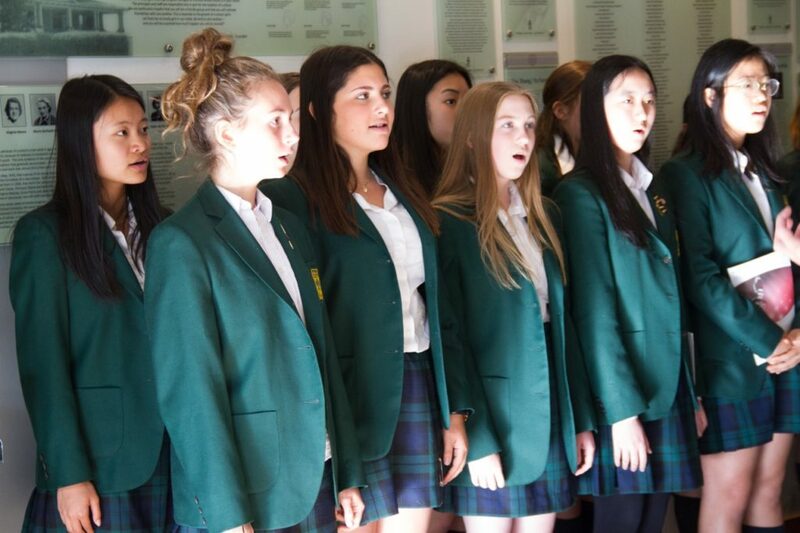 Following the excitement of the morning, the Senior Choral ensemble, Ragazza, set a calm tone for a memorable luncheon with their melodious rendition of Irving Berlin’s Blue Skies. Head of School, Chantal Gionet, introduced the first screening of the 85th YHS Video featuring alumnae through the decades. Each alumna shared their most meaningful experiences from their times including words of wisdom for Yorkies today. Grace was said by class rep, Nora (Mitchell) Newlands ’67, using the well-remembered words of founding Head of School, Mrs. Clarke, “For what we are about to receive may the Lord make us truly thankful.” Spirited conversations continued over lunch as though no time had gone by since school days. 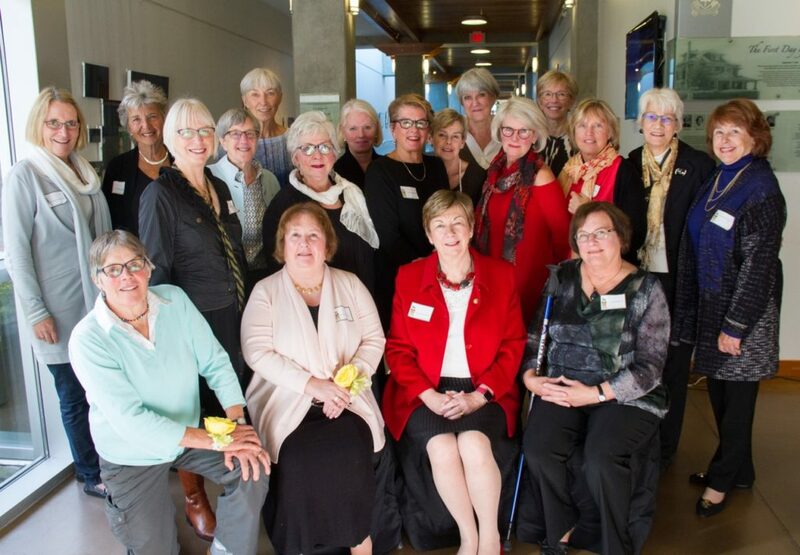 “It was quite something that after 50 years, we could reconnect so quickly and enjoy each other’s company,” mused an alumna from the class of 1967. Another felt similarly, “It didn’t feel like 50 years could possibly have passed since leaving. Oh, to be 16 again and have a couple of years in this new facility with its incredible energy and warmth.” Glasses were raised in honour of 50th through 65th reunions and there was much catching up between classmates and friends both old and new. There was also the chance to meet some of the youngest students in the school when Junior students brought Yorkie green and gold chocolates to each table. 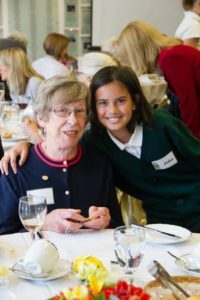 What a wonderful surprise when young Yorkies discovered their alumnae grandmothers at the luncheon! The day ended with a fun tour of the Senior School and the museum led by Gillian (White) Smith ’81, Parent Association President with Susannah Smith, YHS Museum Archivist and Curator. Many expressed amazement at the design of the building and what they saw—photos from their days at the school, uniforms from the early years and the discovery of the names of their whole class etched in the stairway glass. Following the tour, alumnae left to continue their reunion celebrations late into the evening. Some were so inspired and energized by this year’s Alumnae Special Achiever, Dianne Whelan’s warmth and courage in her assembly presentation about her Trans Canada journey that they planned to return early the next morning to hear more on Alumnae Day! This year’s Special Achiever, Dianne Whelan ‘83, made a special effort to be at York House to speak at both Founders’ Day and Alumnae Day to celebrate our 85th Anniversary. In fact, a bush pilot extracted her from a remote area along the Trans Canada trail where, since July 2015, she has hiked, biked, snowshoed, skied, and canoed across the country. As she passes through some 15,000 communities along the 24,000 kilometers of the trail, she’s filming her next adventure documentary, 500 Days in the Wild. 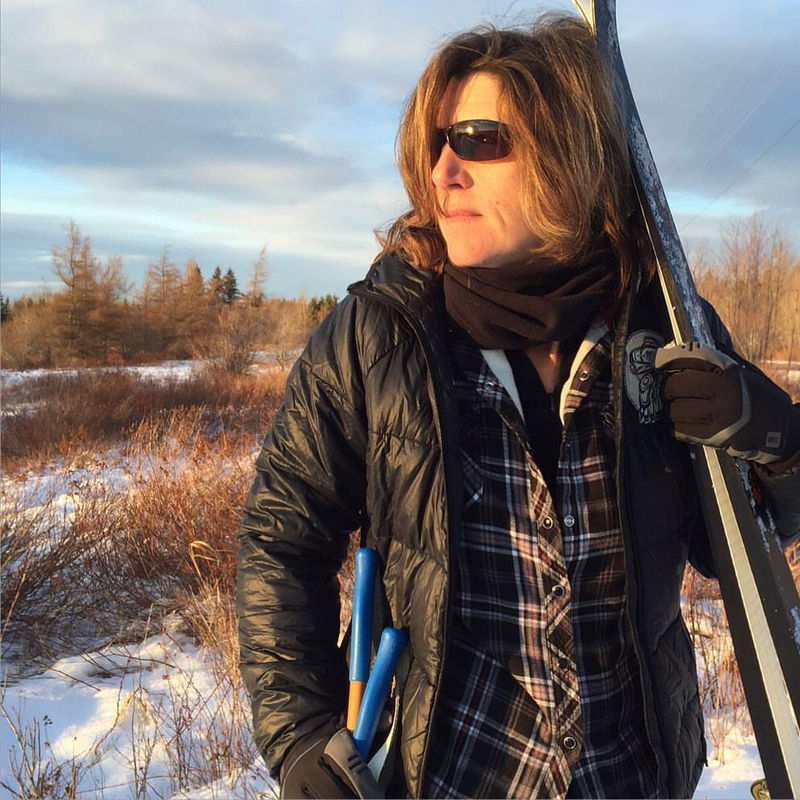 Former York House School Head Girl, Dianne Whelan ’83, an explorer, award-winning Canadian documentary filmmaker, author, and multimedia artist, is no stranger to extreme adventure. 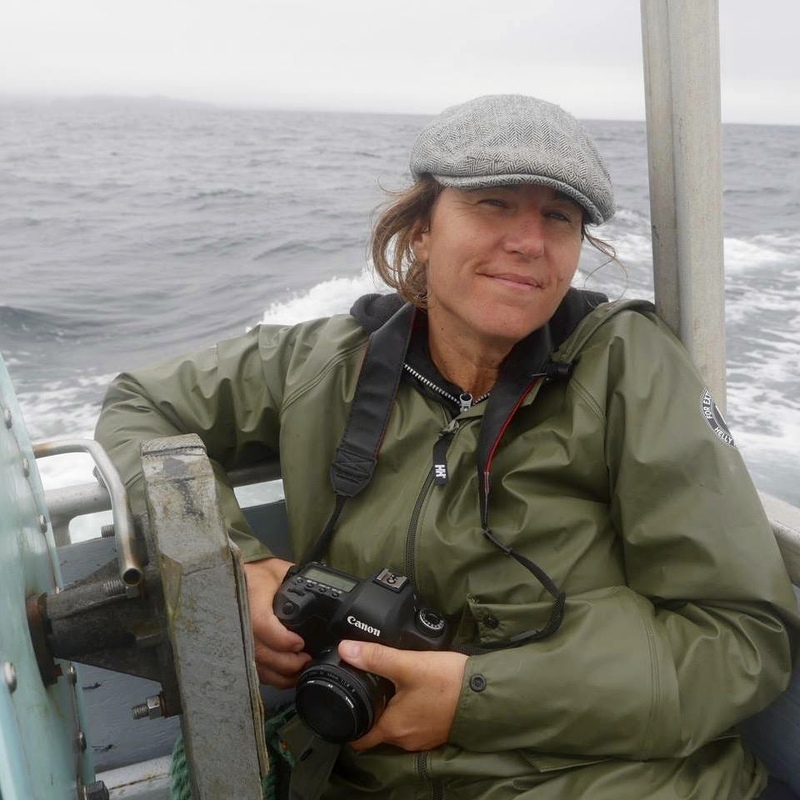 In 2007, Dianne was the first woman to travel as an embedded media person with a team of Canadian Rangers to a never patrolled route of the northwestern coast of Ellesmere Island, Nunavut. In the middle of winter, they traversed close to 2000 km in the Canadian High Arctic from Resolute to Alert, the most northerly human habitation in the world. Her film, This Land and first book, This Vanishing Land A Woman’s Journey to the Canadian Arctic, depicts her epic journey. In 2010, she filmed her award-winning film, 40 Days at Base Camp, which recounts her eye-opening experiences on the world’s highest mountain, Mt. Everest. 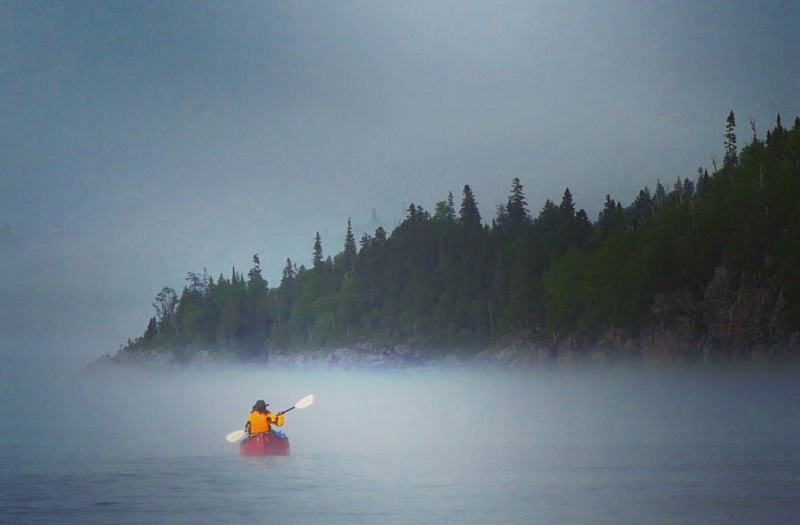 In support of her journey along the Trans Canada Trail, Dianne was recently honoured to receive an expedition grant from the Royal Canadian Geographic Society for the 2,300-km paddle of Lake Superior. 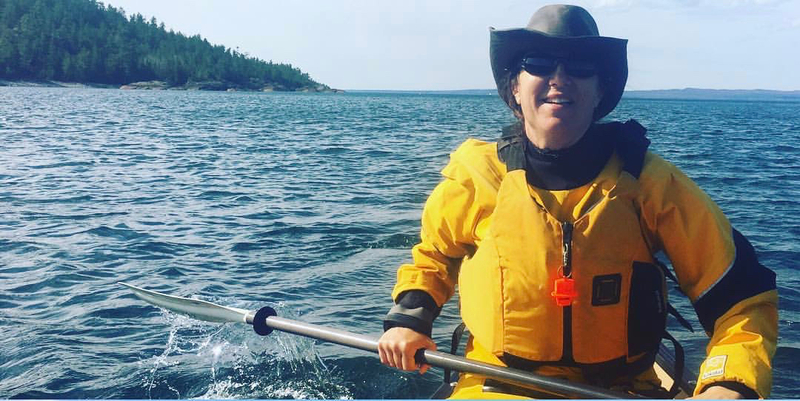 With North America’s largest lake behind her, Dianne is continuing along “The Path of the Paddle”, a water route in Northwestern Ontario, which follows centuries-old traditional First Nations and Metis trails. Dianne received another honour earlier this year when her film, This Land, a National Film Board documentary, made the Celebrate Canada 150 list. We were fortunate to be able to sit down with Dianne while she was here to talk about what her Trans Canada journey has shown her so far. Before setting out, Dianne had titled the trip and pending film, 500 Days in the Wild. This was when she thought she would be travelling the longest trail in the world at a pace of 70 km per day. She lets out a good natured laugh when she thinks back on her ambition. By Day 3, after leaving Newfoundland, Dianne soon came to the realization that it was going to take her considerably more time. In fact, it will likely take her four years, or 1,460 days, to complete but she is no longer in a hurry. But now, more important than how hard or fast she goes, is her interactions with people along the trail. Now, at the halfway mark, she has been particularly impressed with the kindness that people have shown her along the way. Their generosity has confirmed for her that people truly are good in a way that we often forget. “One thing I really didn’t expect is the exchanges that I have had with indigenous people, particularly the women,” she continues. “First Nations culture teaches us to honour the earth and to honour the women. A Cree grandmother shared with me their collective belief that no decision should be made without thinking of seven generations ahead, which is why I believe that the answers for sustainability are with the First Nations. Her time with indigenous women across the country has also shown her the importance of humility and having an open heart. With so much time in isolation in nature, Dianne has had much time to reflect on the importance of following her heart. While here celebrating Founders’ Day with us, she reminded us all of the importance of not forgetting where we come from and how empowering our motto, Not for Ourselves Alone, truly is. Dianne had come to York House School in Grade 9 as a shy and quiet student, but by Grade 12 she was Head Girl. “When I graduated from York House, I had the confidence that I could do anything I wanted; I left believing in myself. For me, York House is the foundation upon which I built my dreams. We need places like York House to breed strong women,” says Dianne. Thinking back on her path after York House that has led her to this point, Dianne recalls the eight years at McGill University where she studied philosophy, political science, and religious studies. She was on her way to law school at Dalhousie University when she had decided to take a break and work for her father’s fashion company in Vancouver, Marquis of London, where she learned multiple facets of the business ranging from marketing to production. The realization that she needed to follow a different path led her to Langara College where she studied journalism and Emily Carr where she studied multimedia including photography and film. She now recognizes that everything that she has learned, whether at school or in life, has led her to this journey she is on now. This journey to see and to know, that we are not alone. To read more about Dianne’s adventures visit http://500daysinthewild.com.